Direct Quarantine toolbar is grayed out and right clicking on spam shows the spam option as grayed out (or going to quarantine shows zero messages). No communication between the workstation and modusGate. You can test by using telnet on the workstation to the port 9000 of modusGate (ie: telnet gate.yourdomain.com 9000) will usually tell you right away if the connection is happening or not. If the connection is failing, make sure you open up port 9000 on your firewall between that workstation and your modusGate server. License problem – your key doesn’t have dQ cleared or it’s expired. Check in the modusGate advanced console -> SYSTEM -> License key and where it shows directQuarantine, make sure it says “directQuarantine licenses”. If not contact your sales rep.
Failure to handshake: On first statup, modusGate will send a handshake email to the user’s mailbox that _should_ be picked up by directQuarantine. Sometimes that handshake email doesn’t make it to their inbox (it’s deemed as junk so sent to Junk Mail folder for instance, or some other third-party tool intercepted the message). You can workaround that by forcing an authentication (see below). A bug – in those cases, if points 1, 2 and 3 fail – you should escalate to our support team with the log files (see below). 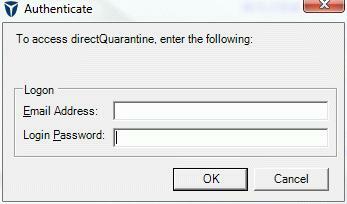 First, before calling the support team or emailing support, try getting the direct Quarantine log file. Usually you will find the log file under C:\users\<username>\appdata\local\vircom\directQuarantine (folder). Locate the files called vircom.dQ.Client.Log and vircom.dQ.Client.config. Zip them up and keep them handy when you open the ticket with support, email it to them as soon as you have a ticket with the support team. Get on the affected desktop and force an authentication. Press down on the Left-CTRL and Left-SHIFT buttons on the keyboard while you click on the little blue envelope icon in the direct quarantine toolbar. Put in the users email address and windows password. The toolbar will be enabled.